"Qingming" redirects here. For the solar term, see Qingming (solar term). The Qingming or Ching Ming festival, also known as Tomb-Sweeping Day in English (sometimes also called Chinese Memorial Day or Ancestors' Day), is a traditional Chinese festival observed by the Han Chinese of China, Taiwan, Hong Kong, Macau, Malaysia, Singapore, Indonesia, Thailand. It's also observed by the Chitty of Melaka and Singapore. It falls on the first day of the fifth solar term of the traditional Chinese lunisolar calendar. This makes it the 15th day after the Spring Equinox, either 4 or 5 April in a given year. During Qingming, Chinese families visit the tombs of their ancestors to clean the gravesites, pray to their ancestors, and make ritual offerings. Offerings would typically include traditional food dishes, and the burning of joss sticks and joss paper. The holiday recognizes the traditional reverence of one's ancestors in Chinese culture. The Qingming Festival has been observed by the Chinese for over 2500 years. It became a public holiday in mainland China in 2008. In Taiwan, the public holiday was in the past observed on 5 April to honor the death of Chiang Kai-shek on that day in 1975, but with Chiang's popularity waning, this convention is not being observed. A similar holiday is observed in the Ryukyu Islands, called Shīmī in the local language. In mainland China, the holiday is associated with the consumption of qingtuan, green dumplings made of glutinous rice and Chinese mugwort or barley grass. A similar confection called caozaiguo or shuchuguo, made with Jersey cudweed, is consumed in Taiwan. The festival originated from the Cold Food or Hanshi Festival which remembered Jie Zitui, a nobleman of the state of Jin (modern Shanxi) during the Spring and Autumn Period. Amid the Li Ji Unrest, he followed his master Prince Chong'er in 655 BC to exile among the Di tribes and around China. Supposedly, he once even cut meat from his own thigh to provide his lord with soup. In 636 BC, Duke Mu of Qin invaded Jin and enthroned Chong'er as its duke, where he was generous in rewarding those who had helped him in his time of need. Owing either to his own high-mindedness or to the duke's neglect, however, Jie was long passed over. He finally retired to the forest around Mount Mian with his elderly mother. The duke went to the forest in 636 BC but could not find them. He then ordered his men to set fire to the forest in order to force Jie out. When Jie and his mother were killed instead, the duke was overcome with remorse and erected a temple in his honor. The people of Shanxi subsequently revered Jie as an immortal and avoided lighting fires for as long as a month in the depths of winter, a practice so injurious to children and the elderly that the area's rulers unsuccessfully attempted to ban it for centuries. A compromise finally developed where it was restricted to 3 days around the Qingming solar term in mid-spring. The present importance of the holiday is credited to Emperor Xuanzong of Tang. Wealthy citizens in China were reportedly holding too many extravagant and ostentatiously expensive ceremonies in honor of their ancestors. In AD 732, Xuanzong sought to curb this practice by declaring that such respects could be formally paid only once a year, on Qingming. Qingming Festival is when Chinese people traditionally visit ancestral tombs to sweep them. This tradition has been legislated by the Emperors who built majestic imperial tombstones for every dynasty. For over 5000 years, the Chinese imperials, nobility, merchants and peasantry alike have gathered together to remember the lives of the departed, to visit their tombstones to perform Confucian filial piety by tombsweeping, to visit burial grounds, graveyards or in modern urban cities, the city columbaria, to perform groundskeeping and maintenance, and to commit to pray for their ancestors in the uniquely Chinese concept of the afterlife and to offer remembrances of their ancestors to living blood relatives, their kith and kin. The Qingming Festival commemorates the life of the departed in an elaborate set of rituals often mistranslated in the West as ancestral worship. Actually, it is a Confucian form of posthumous respect and filial piety offered to a Chinese person's ancestors, departed relatives, or parents. Not all Chinese persons will pray directly to their ancestors in ancestral spirit but almost all will observe the Qing Ming Rituals. The young and old alike kneel down to offer prayers before tombstones of the ancestors, offer the burning of joss in both the forms of incense sticks (joss-sticks) and silver-leafed paper (joss-paper), sweep the tombs and offer food, tea, wine, chopsticks, and/or libations in memory of the ancestors. Depending on the religion of the observers, some pray to a higher deity to honour their ancestors while others may pray directly to the ancestral spirits. These rites have a long tradition in Asia, especially among the imperialty who legislated these rituals into a national religion. They have been preserved especially by the peasantry and are most popular with farmers today, who believe that continued observances will ensure fruitful harvests ahead by appeasing the spirits in the other world. Religious symbols of ritual purity, such as pomegranate and willow branches, are popular at this time. Some people carry willow branches with them on Qingming or stick willow branches on their gates and/or front doors. There are similarities to palm leaves used on Palm Sundays in Christianity; both are religious rituals. Furthermore, the belief is that the willow branches will help ward off the unappeased, troubled and troubling spirits, and/or evil spirits that may be wandering in the earthly realms on Qingming. After gathering on Qingming to perform Confucian clan and family duties at the tombstones, graveyards or columbaria, celebrants spend the rest of the day in clan or family outings, before they start the spring plowing. They often sing and dance. 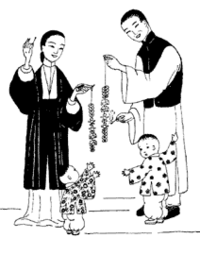 Qingming is also a time when young couples traditionally start courting. Another popular thing to do is to fly kites in the shapes of animals or characters from Chinese opera. Another common practice is to carry flowers instead of burning paper, incense, or firecrackers. Despite having no official status, the overseas Chinese communities in Southeast Asian nations, such as those in Singapore and Malaysia, take this festival seriously and observe its traditions faithfully. Some Qingming rituals and ancestral veneration decorum observed by the overseas Chinese in Malaysia and Singapore can be dated back to Ming and Qing dynasties, as the overseas communities were not affected by the Cultural Revolution in Mainland China. Qingming in Malaysia is an elaborate family function or a clan feast (usually organized by the respective clan association) to commemorate and honour recently deceased relatives at their grave sites and distant ancestors from China at home altars, clan temples or makeshift altars in Buddhist or Taoist temples. For the overseas Chinese community, the Qingming festival is very much a family celebration and, at the same time, a family obligation. They see this festival as a time of reflection for honouring and giving thanks to their forefathers. Overseas Chinese normally visit the graves of their recently deceased relatives on the weekend nearest to the actual date. According to the ancient custom, grave site veneration is only permissible ten days before and after the Qingming Festival. If the visit is not on the actual date, normally veneration before Qingming is encouraged. The Qingming Festival in Malaysia and Singapore normally starts early in the morning by paying respect to distant ancestors from China at home altars. This is followed by visiting the graves of close relatives in the country. Some follow the concept of filial piety to the extent of visiting the graves of their ancestors in mainland China. Traditionally, the family will burn spirit money and paper replicas of material goods such as cars, homes, phones and paper servants. In Chinese culture, it is believed that people still need all of those things in the afterlife. Then family members take turns to kowtow three to nine times (depending on the family adherence to traditional values) before the tomb of the ancestors. The Kowtowing ritual in front of the grave is performed in the order of patriarchal seniority within the family. After the ancestor worship at the grave site, the whole family or the whole clan feast on the food and drink they have brought for the worship either at the site or in nearby gardens in the memorial park, signifying the family's reunion with its ancestors. Another ritual related to the festival is the cockfight, as well as being available within that historic and cultural context at Kaifeng Millennium City Park (Qingming Riverside Landscape Garden). The holiday is often marked by people paying respects to those who are considered national or legendary heroes, or those exemplary Chinese figures who died in events considered politically sensitive. The April Fifth Movement and the Tiananmen Incident were major events in Chinese history which occurred on Qingming. After Premier Zhou Enlai died in 1976, thousands honored him during the festival to pay their respects. Many also pay respects to victims of the Tiananmen Square protests in 1989 and Zhao Ziyang. The Qingming festival was originally considered the day with the best spring weather, when many people would go out and travel. The Old Book of Tang describes this custom and mentions of it may be found in ancient poetry. During the Tang dynasty, Emperor Xuanzong of Tang promoted large-scale tug of war games, using ropes of up to 167 metres (548 ft) with shorter ropes attached, and more than 500 people on each end of the rope. Each side also had its own team of drummers to encourage the participants. In honor of these customs, families often go hiking or kiting, play Chinese soccer or tug-of-war, and plant trees. The Qingming festival is also part of spiritual and religious practice in China. For example, Buddhism teaches that those who die with guilt are unable to eat in the afterlife, except on the day of the Qingming festival. ^ "General holidays for 2015". GovHK. Retrieved 25 August 2014. ^ "Macau Government Tourist Office". Macau Tourism. Retrieved 25 August 2014. ^ "Traditional Chinese Festivals". china.org.cn. 5 April 2007. Retrieved 25 August 2014. ^ "Tomb Sweeping Day". Taiwan.gov.tw. Archived from the original on 7 April 2014. Retrieved 25 August 2014. ^ "寒食清明节:纪念晋国大夫介之推". Cathay.ce.cn. Retrieved 25 August 2014. ^ "Asia News - South Asia News - Latest headlines – News, Photos, Videos". UPIAsia.com. 22 July 2012. Retrieved 25 August 2014. ^ "Festival of Pure Brightness". Uiowa.edu. Archived from the original on 19 November 2014. Retrieved 25 August 2014. ^ "Millennium City Park, Kaifeng, Henan". Travelchinaguide.com. Retrieved 25 August 2014. ^ "Qingming Riverside Landscape Garden". Cultural-china.com. Archived from the original on 12 August 2015. Retrieved 25 August 2014. ^ "Celebration". China Daily. 3 March 2013. Retrieved 18 March 2014. ^ "China clamps down on Qing Ming". Straits Times. 8 April 2009. Archived from the original on 20 March 2014. Retrieved 18 March 2014. ^ Xu, Liu. "Old Book of Tang": 13. ^ "Chinese Traditional Holidays". Qingming Festival Customs. China Internet News Center.